EDF-5.4 is a glass bioreactor with working volume till 4.5 l (total volume 6.2 l, inside diameter 150mm). The bioreactor is mounted on stainless steel pipeline legs. It is foreseen for the cultivation of bacterial cultures, filamentous fungi, yeast, microalgae, mammalian cell cultures and stem cells. 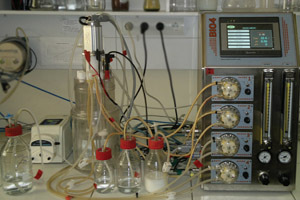 Depending on the applied microbial culture it is possible to adapt the configuration of the bioreactor in a corresponding way. Other standard accessories to ensure full functionality of the fermentation process (bottles for titration liquids, tubes, spare parts etc.). 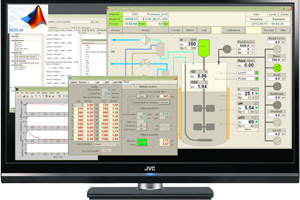 A PC SCADA program for process data monitoring, data archiving and control. A special USB dongle key for seamless remote access to the SCADA system can be supplied. Customer specialised solutions for adapting to different microorganisms cultivation tasks. Photobioreactor PBR is a glass autoclavable photobioreactor with working volume 2-4.5 l (total volume 6.2 l, internal diameter - 150 mm). 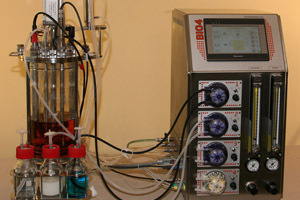 The bioreactor is used for precise phototrophic cultivation of algae and cyanobacteria. Stainless steel monoblock construction. In monoblock are included: bioprocess controller BIO-4, thermostat, peristaltic pumps, power parts, LED control, gas supply (air, CO2) and mixing unit. Mixing system for mycelial or other shear sensitive microorganisms consisting of 2 mixers with 3 pitched-blades. Peristaltic pump for Chemostat mode cultivation, i.e. programed addition of substrate and other substances. EDF-15.1 is a glass bioreactor with working volume till 10 l (total volume 16 l, inner diameter 200mm). The bioreactor is mounted on stainless steel pipe legs. It is foreseen for the cultivation of bacterial cultures, filamentous fungi, yeast, mammalian cell cultures and steam cells. 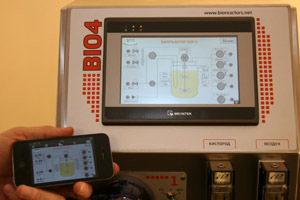 Depending on the applied microbial culture it is possible to adapt the configuration of the bioreactor in a corresponding way. 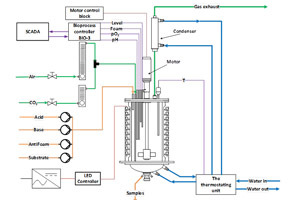 The EDF-5.4 monoblock can be adapted for single use bioreactor control. For example, we have expierence in application of single use vessels from CerCell (Danmark). CerCell has configurable vessels of different volumes (0.5 to75 liters). These vessels are equipped with all necessary accessories to provide fermentations of different microbial cultures. An important advantage of these vessels is the possibility to achieve high mixer rotation speeds. 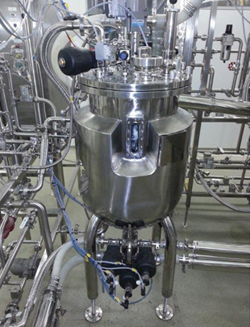 For example, 7.5 liter bioreactor, equipped with 3 ruchton turbines, can achieve mixer rotation speed up to 1500 rpm. In SUB it is possible to apply both single use and sterilizable pH and pO2 sensors. The possibility to develop the fermentation processes according GMP requirements. We have tested 7.5 liter vessel from CerCell in fed-batch cultivation of E.Coli. 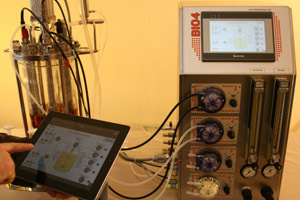 Obtained results were comparable with fermentations in a laboratory scale autoclavable glass bioreactor. 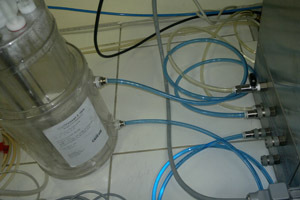 The connections between the bioreactor vessel and the technological stand are implemented with the help of flexible parallel wrapped stainless steel tubes. To ensure fully automated in-situ sterilization process, it is necessary to install pneumatically controlled membrane valves in the bottom, the inlet of a sparger and the lid of the vessel. 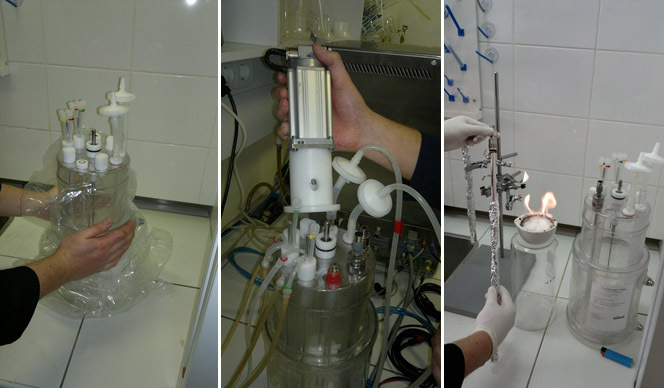 The fully equipped stainless steel bioreactor vessel (sterilizable in place) with upper or lower magnetic drive for agitation with 2 – 3 standard rushton turbines (pitched blade or marine mixer optionally). For all vessels H:D is in the range of 1:1.5 to 1:3. It can be specified in certain limiting sizes. For all vessels the maximal design pressure inside the vessels – 3.0 bar, in jacket – 3.5 bar. Maximal temperature – 1400C. Inner vessel wall: surface roughness lower than 0.4µm. Outer vessel wall: surface roughness – 0.63 µm (pickled & passivated). The material of the parts, contacting with product is stainless steel 316L. For parts, not contacting with product (for example, jacket), – stainless steel 304. All bioreactors have insulation over the jacket. The outside surface of insulation is covered by stainless steel 304. The aeration system includes a ring sparger with maximal flow rate of 2 vvm. DN=25mm ports according to Ingold standard are installed in the lower cylindrical part for inserting sterilizable pH, pO2 and temperature sensors, as well as a DN=25mm port according to Ingold standard for the sterilizable sampling device. 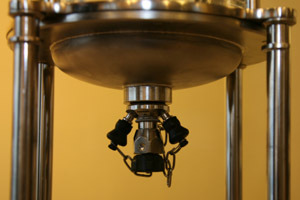 A stainless steel membrane pressure sensor (Endress+Hauser) and a pneumatically controlled membrane valve are placed in the bottom of the vessel. In the upper cylindrical part there is a longsided sight glass. 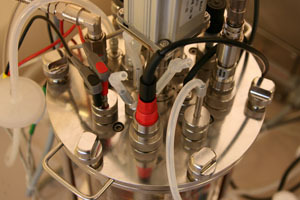 Following accessories are placed in the lid of a basic configuration: Membrane pressure manometer, safety valve, needles with membrane valves for titrating (2-4), sight glasses with lighting, overpressure sensor with control signal (Endress + Hauser), foam and level sensors, CIP washing head, additional sanitary tri-clamp based connections. Technological stand includes pipeline connections for supply of air, purified water, steam, purofied steam, as well as for filtration of air, thermostating, sterilization, sampling and discharging. A group of pneumatically controlled valves ensures fully automatic control of sterilization and thermostating. Inlet and outlet air supply filters (PALL), as well as air pressure control system and stainless steel air supply control rotameter (MFC and system of O2 enrichment – as options) are also installed in the stand. Separate sterilization of the air filters. The processes, including also all sterilization variants, are fully automated. Power control cabinet is made of stainless steel (RITTAL, Germany) and includes PLC based on Siemens Simatic series S7-300. Additional gas supply and mixing (O2, N2, CO2). Loading and discharge of the substrate or biomass. The determination of access level for every user.